Food and skiing/boarding go hand in hand, all that time outdoors really builds up the appetite. Most resorts have a range of restaurants and it’s generally pretty easy to find a lots of steak houses, fondue/raclette restaurants and pizzerias regardless of the resort you decide to visit. However, finding that snack bar or bakery that ends up supplying most of your lunches and a few apres-ski-before-dinner snacks can be a little bit trickier. As we’ve spent quite a lot of time in resorts (over 14 seasons between us) so we have a few tips to share with you! Most people probably don’t know the name of this one but it’s a real 3 Valley institution. One of the best burgers in the 3 Valleys and really well priced. Try the raclette burger, you won’t be disappointed! 2. The Forum Bakery in Courchevel 1850. We all know Courchevel 1850 can be hideously expensive. This bakery is tucked inside the Forum shopping centre and it’s the place to go to grab a quick sandwich or snack before heading back out onto the slopes. Our tip is the Fougasse, not only is it tasty but it’s enormous too! 3. La Tartine in Val d’Isere. First of all, the location is spot on for a quick pit stop. Right on the “front de neige” in Val centre and next to one of the lift pass offices. You can ski back to this point, making it a really handy place for a snack. Try the Rouleaux Saucisse (sausage roll but sounds better in French!). 4. 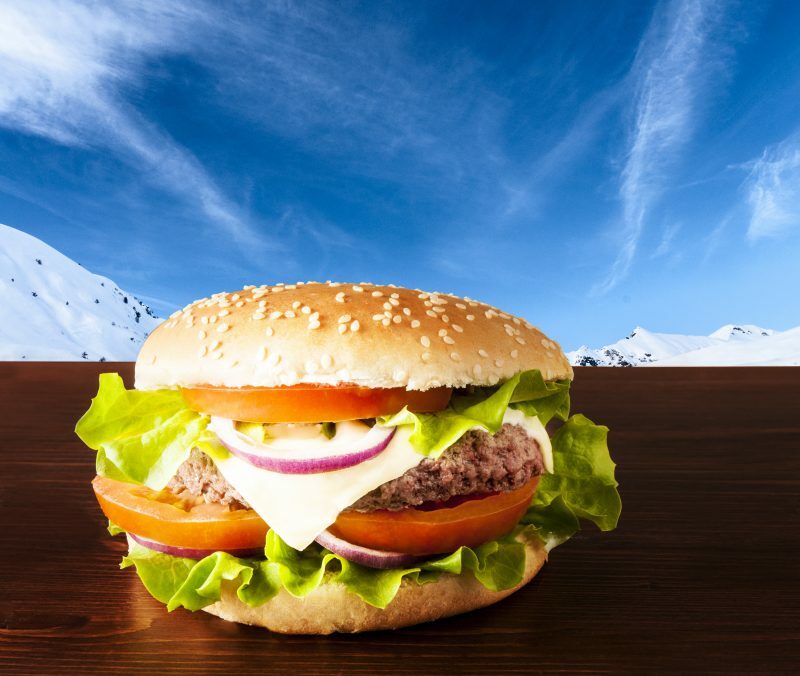 Croq Burger in Tignes Le Lac. Great burgers and a real sun trap late season. Try the Sandwich Americain, a baguette filled with steak hache and frites. One of these will easily feed two people! Located in the centre Morzine, this cafe serves a wide range of food so generally has something for everyone. Pizzas, noodles and wraps. If you are hell bent on a decent fish and chips, this place does one of the best we’ve ever tried in France! A little burger shack on the main street tactically located outside the Rois Mages pub. if you’ve been to Montgenevre then there is a very good chance you’ve sampled it’s delights! Probably the most popular place to grab a bite in Chamonix. Located on the main high street, this little snack bar is one of the best value places to eat in a not particularly cheap town. It does get really busy and the interior is quite “cosy” but the lack of space is more than worth it. If you have some suggestions to add to the list, we’d love to hear them!